Winter is coming, the season of ramen, onsen, Asahis and heaaaps of powder snow. It's time to talk JAPOW! Our favorite winter destination -so far- and one of our favorite moments of the year. A ski trip in Hokkaido, a winter wonderland. With an average annual snowfall of 15 meters, it's clear why Hokkaido is known as one of the hottest ski destinations in the world. Located in northern Japan, the island gets the cold air from Siberia across the Sea of Japan, which results in the ski resorts being absolutely DUMPED with dry powder. A heaven for powder hounds. We've spent the last couple of winters exploring the island, from Furano to Rusutsu. There's still plenty to discover, but here's a beginning... Discover the itinerary of a powder hunt in Hokkaido. Wanna see how it looks in summer? Discover our Summer road trip in Hokkaido! We choose to stay down the lifts in Kitanomine instead of staying in Furano, which is further away. The village is really small and authentic -far from fancy Niseko-, with a vintage kind of charm. Everybody knows everybody around here, it's a lovely friendly little town. The ski resort itself is magnificent and offers plenty of opportunities to enjoy the powder -backcountry particularly, as often in Japan. For a cosy muffin/hot chocolate break, the Whiteroom Cafe is just down the lift. At night, all riders meet in the same and only bar, Ajito -a great place to meet the locals, play pool, have a game of darts or just relax with a cold Asahi watching ski videos on the big TV screen. Don't miss the amazing teppan okonomiyaki (Japanese pancakes) in Masaya Furano. You'll probably have to queue a bit as it's a very popular place, but believe me: it is worth it! A nice place to stay? With no doubts Pension Lavender. Once your legs start to be painful -too much powder, TOO MUCH POWDER! !-, take a bus and head to Jozankei, Hokkaido's fairytale town. You'll be able to pamper yourself and get rid of the pain in one of the many beautiful onsens there (hot springs). 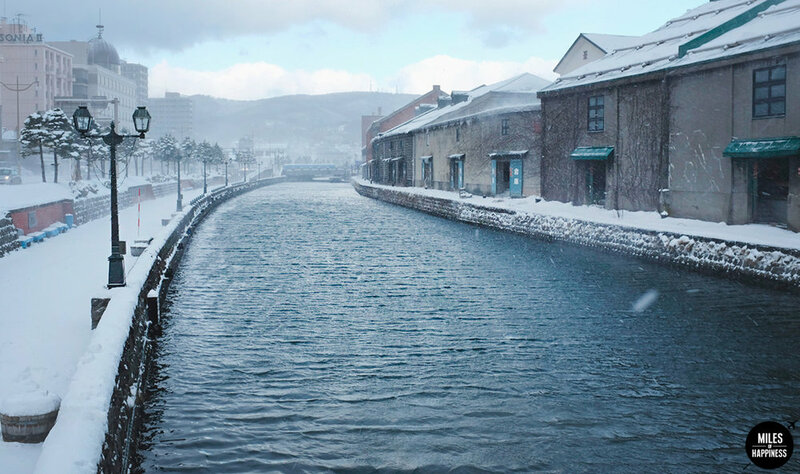 If you dream about a romantic trip under the snow, Otaru is the destination. We based ourselves in this lovely port town on the coast to go shred in Kiroro and Kokusai, two tiny ski resorts 40 minutes drive from there. Otaru is one of the prettiest towns in Hokkaido. The river, the sea, the boats, the old abandoned railway, the tiny alleys and the snow create all together a magic atmosphere. Kiroro and Kokusai are small but, as usual in Hokkaido, EXCELLENT for backcountry. Actually, it's where I had my very first backcountry experience -yes, I did get stuck drowned in powder and yes, I did crash on a tree, or, you know, many. It's also where I saw that legendary dry powder snow for the first time -as you can see on the pic above. 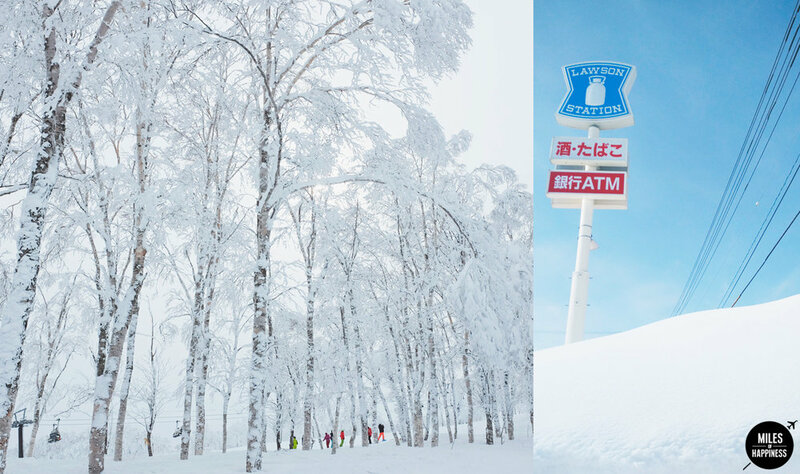 Finish your Hokkaido road trip with a classic: Niseko! This powder playground is known as the place to be for anyone who goes skiing in Hokkaido. Actually, if you too live in Hong Kong or if you're Ozy, you might cross some friends in Niseko -yes, it's full of HK and Australian people. Therefore, you don't come to Niseko for the Japanese culture neither for the serenity -you come in Niseko to party! Well, that, and to ski in that powder obviously. There are three main resort bases around: Grand Hirafu, Niseko Village and Annupuri. If you are into a variety of entertainment, bars, restaurants and nightlife, you want to go Grand Hirafu. The ski runs are long and varied, with a good variety for beginners to advance. Although as it's the most popular ski resort in Hokkaido, it gets very crowded. There are still some amazing runs to do, you just have to find them -we, per example, loved Annupuri's backcountry, or Strawberry fields! There are a few onsens in Grand Hirafu, but it's not the authentic kind -mostly the staring/drinking-beers/being-loud kind. I'd recommend to drive a little bit for a more authentic experience in the next villages. Rusutsu is something else. Only 40 minutes drive from Niseko, it holds some stunning tree runs, gorgeous views, much less people -and often much more snow. I love love LOVE it. Oh and there's this amusement park I told you about this summer, in winter all covered with snow. It's magic! The 15 meters of snow don't fall from blue skies! In winter in Hokkaido, it's mostly dumping snow -sometimes with very low visibility- and very, very cold. Be prepared, don't forget there's dry powder because of the cold air from... Siberia!! It can get as cold as -20°C, so pack plenty of layers and get ready for a freezing-but-awesome ski experience!